Wed, Apr 17, 2019, 09:38 pm SL Time, ColomboPage News Desk, Sri Lanka. This significant reduction in the trade deficit was due to the combined effect of higher earnings from exports and a notable deceleration in import expenditure, the Bank said. Earnings from merchandise exports grew 7.5 percent in January 2019 to US$ 1.038 billion compared with US$ 965 million in January 2018, mainly driven by increased exports from all major sectors. Earnings from industrial exports grew by 9.1 percent during January 2019 due to higher exports of textiles and garments, while earnings from agricultural exports also grew by 1.7 percent for the first time since February 2018. 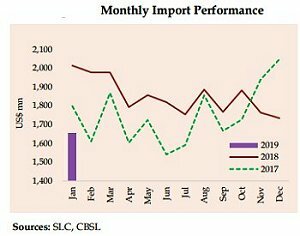 Reflecting the effect of policy measures taken by the Central Bank and the Government, expenditure on imports declined in January 2019 for the third consecutive month by 17.8 percent to US$ 1.655 billion in January 2019 from US$ 2.015 billion a year ago. All major import categories namely intermediate goods, consumer goods and investment goods contributed to this decline, the Central Bank said. The trade deficit declined by 12 percent to US$ 617 million in January 2019 from US$ 701 million in December 2018. Tourist arrivals grew by 2.2 per cent (year-on-year) in January 2019, resulting in earnings from tourism of US$ 458 million during the month. Workers' remittances declined substantially by 25.2 percent, year-on-year, to US$ 545 million in January 2019. Foreign investments in the government securities market and the CSE witnessed reduced net outflows in January 2019. The government securities market recorded a net outflow of US$ 29 million during the month. This is a notable reduction in outflows compared to a net outflow of US$ 188 million in December 2018. The CSE recorded a net outflow of foreign investments of US$ 14 million in January 2019, including both primary and secondary market transactions compared to a net outflow of US$ 26 million in December 2018. 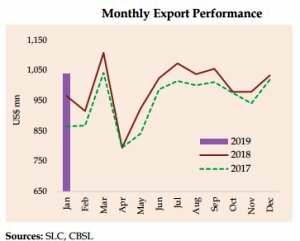 As at end January 2019, gross official reserves were estimated at US$ 6.2 billion, which is equivalent to 3.4 months of imports. Total foreign assets, which consist of gross official reserves and foreign assets of the banking sector, amounted to US$ 8.7 billion as at end January 2019, which is equivalent to 4.8 months of imports. Subsequently, gross official reserves increased to US$ 7.6 billion by end March 2019, equivalent to 4.3 months of imports, with the issuance of ISBs amounting to US$ 2.4 billion.